Recipe submitted by Florence Henderson, Speaking of Women's Health National Honorary Chairperson. 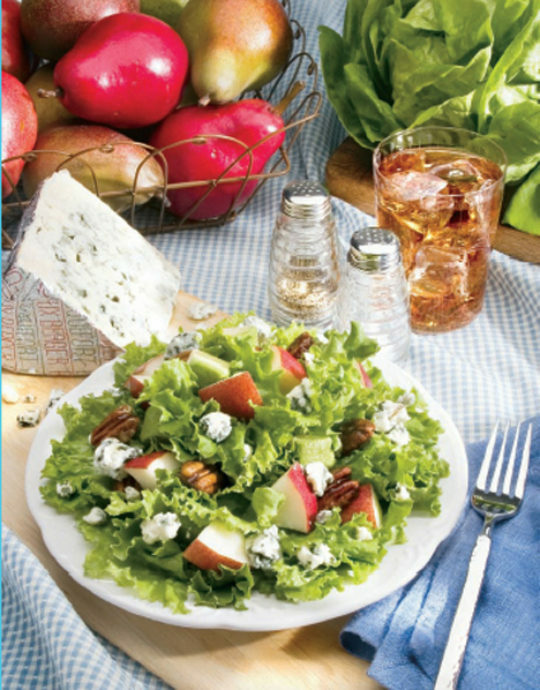 This beautiful salad is filled with plenty of hidden healthy ingredients, like lettuce and pears (antioxidants), walnuts (omega-3s) and blue cheese (a bit of calcium and lots of taste). The salad is perfect for a cool summer night or as the main course at your next get-together. Blend ingredients for dressing in a blender and set aside. In a skillet, over medium heat, cook walnuts with 2 tablespoons sugar. Continue stirring gently until sugar has melted and caramelized the walnuts. Carefully transfer nuts onto waxed paper and allow to cool. Break apart the cooled candied nuts into small pieces. In a large serving bowl, layer lettuce, pears, cheese crumbles, avocado and green onion. Pour the dressing over the salad and top with the walnut pieces.